In 2016, my car broke down. It was the car I’d been driving since age 16, and it had made it to 14 years old. It was time. So I bought my dream car, a Kia Soul. I loved that car. It had Bluetooth! It had power windows, power locks, and a key fob that unlocked the doors remotely! Such simple luxuries, but I was tickled. So in a bittersweet yet practical move, I traded in my Soul for a low-mileage Buick Encore from Carvana. Psst! If you’re in the market for a new car, let me know. I have ten codes for $500 off your Carvana purchase. 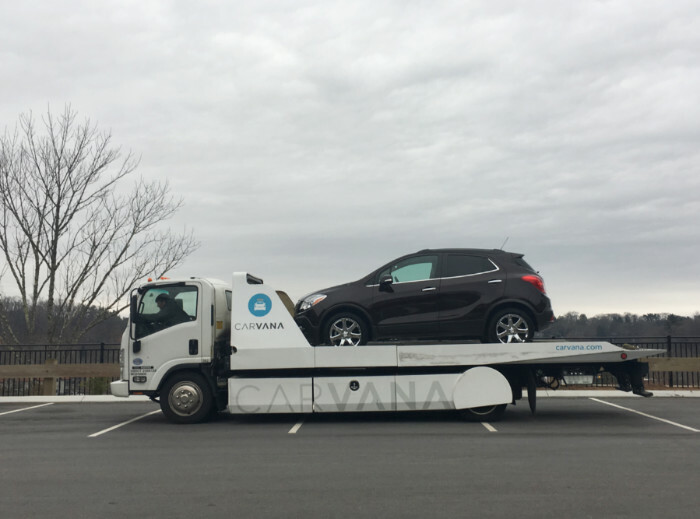 Not sponsored, I just had a good experience with Carvana. 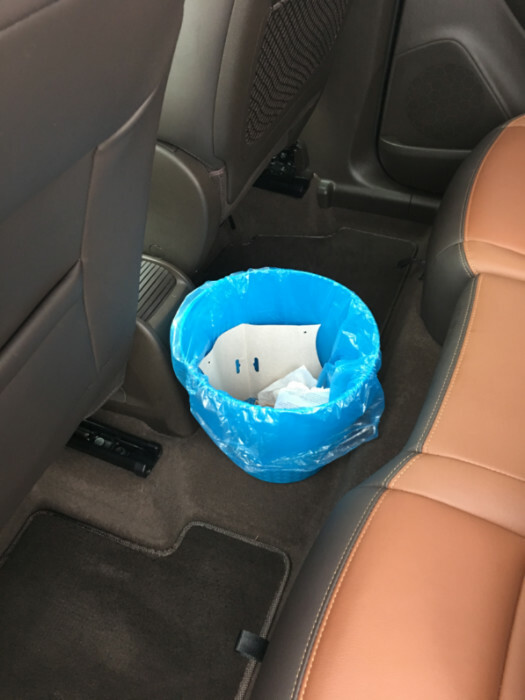 Car Organization Tips: Keeping It Clean and Well-Stocked! After stocking my new wheels with a few of my usual car essentials—lip balm, hand sanitizer, and extra napkins secreted away from various restaurants and coffee shops—inspiration struck. “I should fully organize this car! With cheap items from the dollar store!” So that’s just what I did. 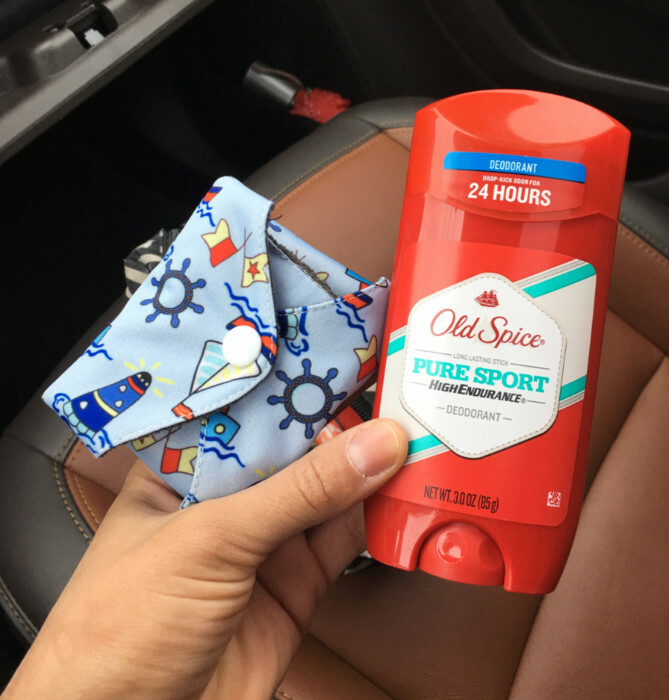 I visited Dollar Tree, Ross, Aldi, and Dollar General to organize my whole car & outfit it with emergency supplies for less than $30! Let’s start with the driver’s side door. 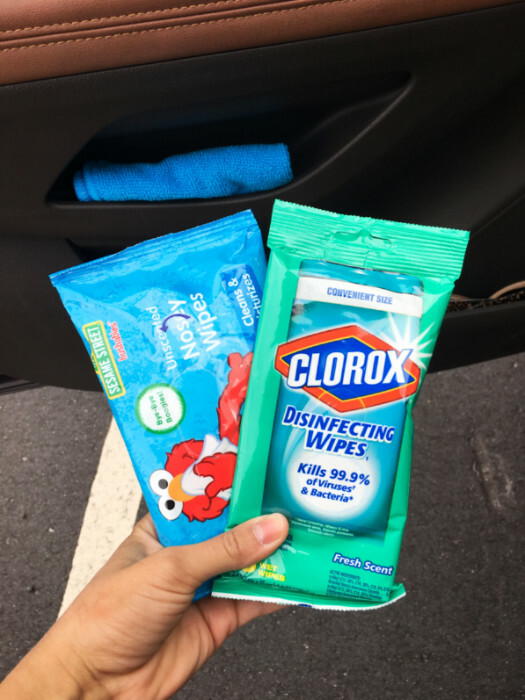 In my driver door pockets, I keep a microfiber cloth for dusting and drying (2 for $1, Dollar Tree), packs of Clorox wipes and baby wipes ($1 each, Dollar Tree), and a backup pair of sunglasses for my sensitive baby eyes. Now moving along to the center console. The console storage space in this car is quite small, so I don’t have room for much. Inside I have extra napkins, a pack of tissues (8 packs for $1, Dollar Tree), a protein bar, and a bottle of ibuprofen…or is it? 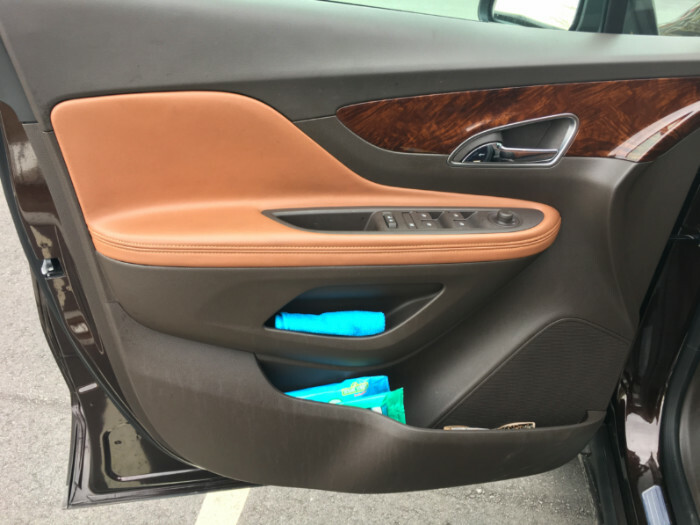 On the passenger’s side, there are two glove compartments. In the main compartment, I keep the car owner’s manual, my registration and insurance information, a toiletries kit, and a first aid kit. 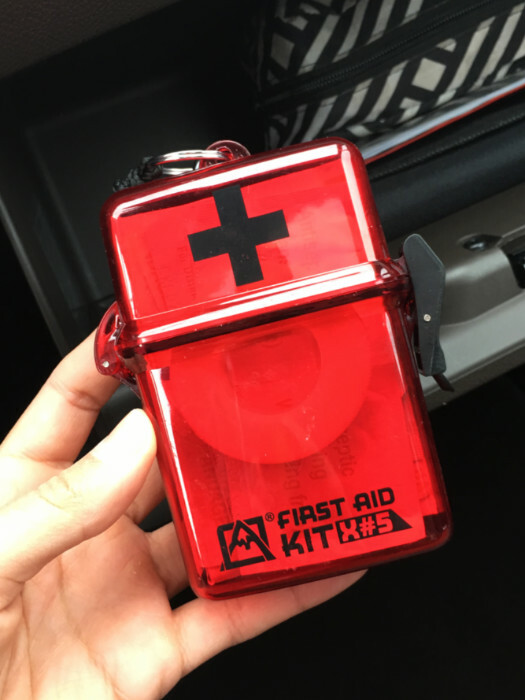 I got this compact first aid kit at Ross for $4.99. It has regular bandages, blister bandages, gauze, alcohol pads, antiseptic pads, and medical tape and is attached to a carabiner. Handy! 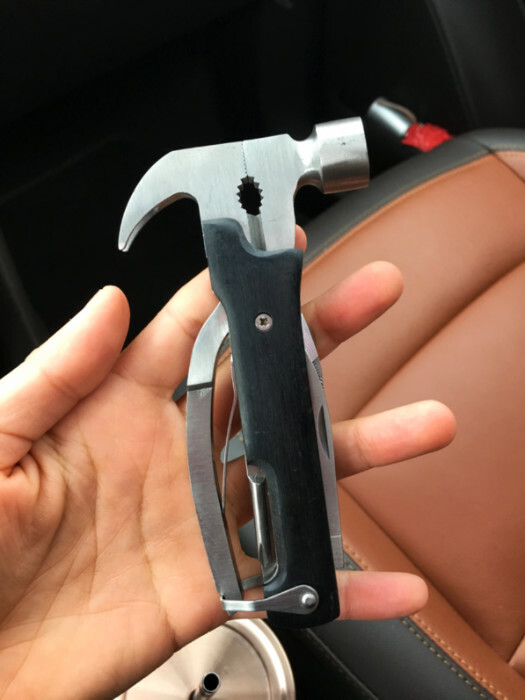 In the smaller glove box, I keep just a few things: scissors, scotch tape, a tape measure, and this multi-tool that includes a hammer, screwdriver, and more. It’s good to keep a hammer and something to cut with, in case you need to break a window or cut a seatbelt to escape the car in an emergency. The tool I have was $6.99 at Ross, but on Amazon you can find specialized tools made for escaping cars. I put velcro strips on the bottom to attach it to the carpet and prevent sliding! I keep the package of trash bags at the bottom of the can so I’ll always have a fresh one handy. And finally, the trunk. I like to keep the trunk mostly empty so I have room for groceries or whatever I need to tote. The small storage space on the left holds my extra tissues and the extra microfiber cloth from the 2-pack. 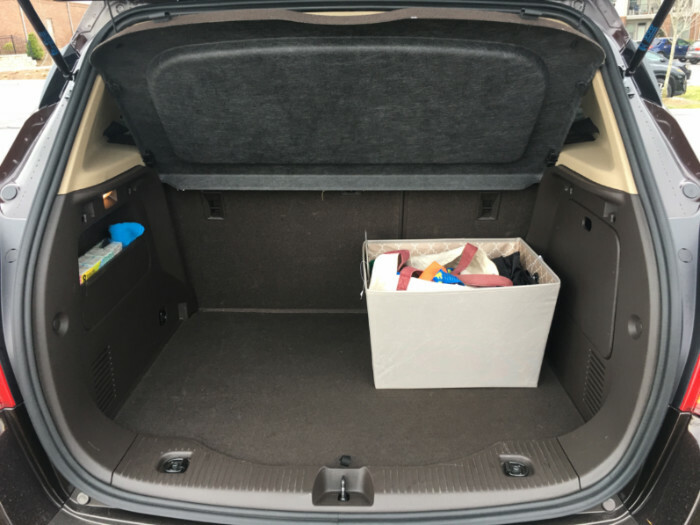 I picked up a fabric bin from Aldi’s Special Buys section for $6.99 to corral the few other items I keep handy in the trunk. The bin holds my reusable bags, my picnic/stadium blanket, and a bottle of bug spray I got from Dollar General for $4.50. 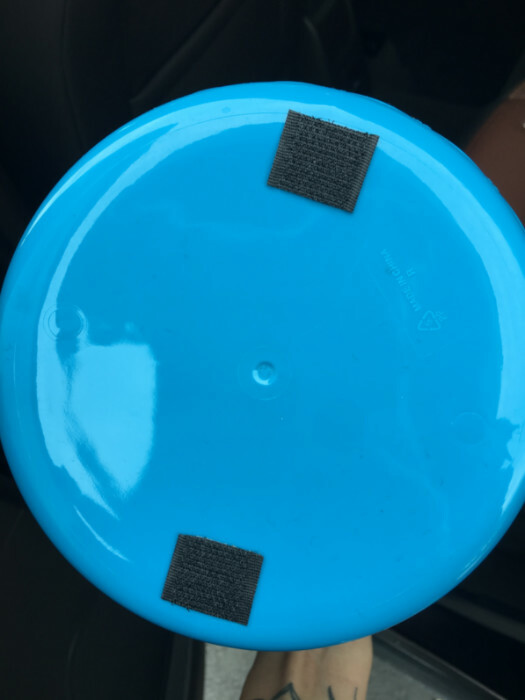 I always forget bug spray when I do outdoor activities, so keeping it in my car is insurance that I won’t get bitten for once. 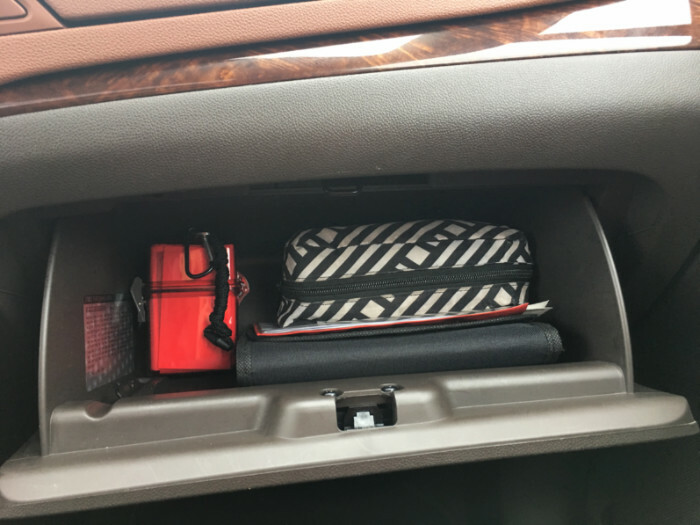 So let’s recap everything that went into my car organization haul! GRAND TOTAL: $30.72. 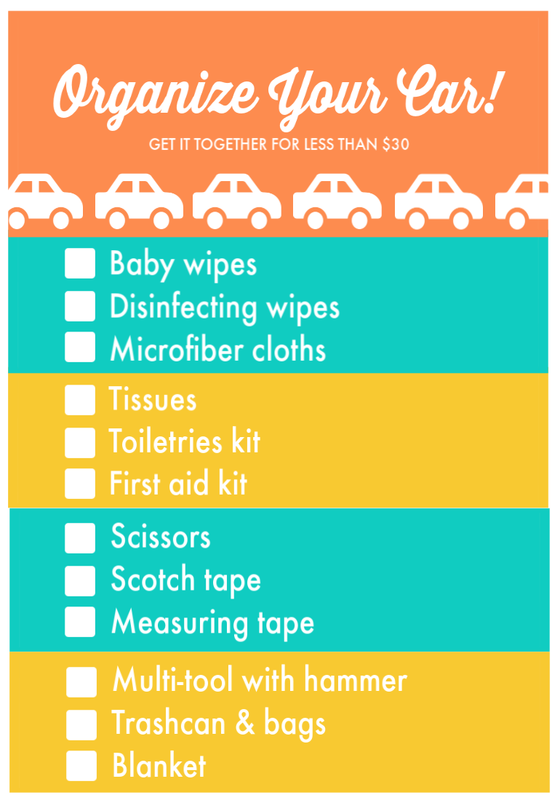 I think $30 to outfit a whole car with convenience and emergency items is pretty great. Patting myself on the back. 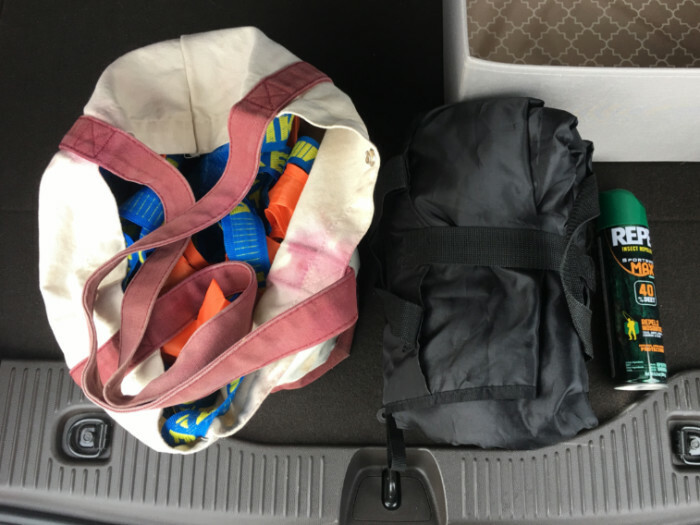 What other essentials do you keep in your car? I’ve been watching car organization videos on YouTube and can’t get enough of everyone’s clever ideas! Thank you for these tips. I try to keep my car as tidy as possible but sometimes I do leave some junk in there. 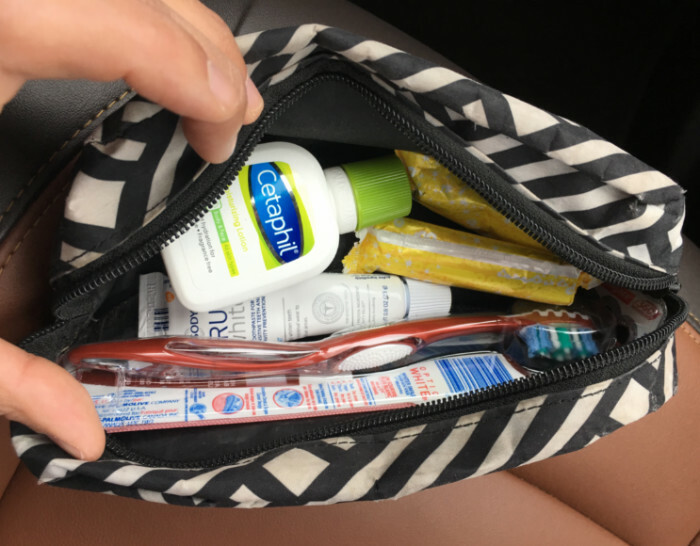 The only thing I am very consistent with is keeping an emergency medical kit in my car. I really like the Velcro on the garbage can! I need to figure out a way to keep my car more tidy. It makes me crazy. Love all your ideas! I can’t wait to use some of them in my own vehicle! I’m tired of seeing thins all over the place! 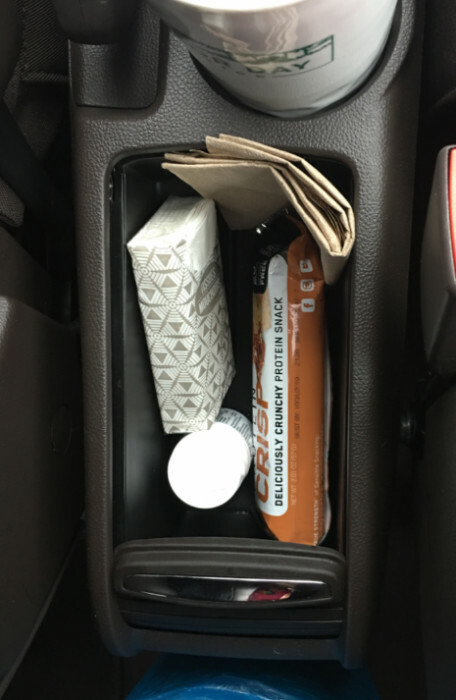 I love how organized is your car! These are really the best tips ever! I really need them! This is such a helpful guide! My car is in desperate need of some cleaning and reorganizing. Thanks for the inspiration! So many great items and all of that would make a great gift basket idea for a new Mom or maybe even for a wedding gift. I like the idea of velcro strips on a small waste basket. That just makes a lot of sense. 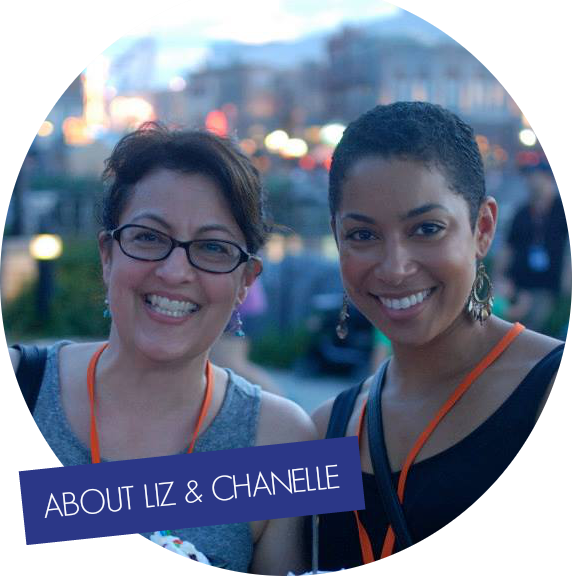 These are fabulous tips! So smart to stock up and keep things organized should you need it in an emergency. My dad is always on my case about keeping emergency supplies in the car. The microfiber cloths are so simple and have a million uses yet something I would not have even thought of. I do have an extra towel in the back that saw a bunch of use moving wayward turtles out of the middle of the street last year so I guess that counts for something. That looks like a great new car! When we need our next car I might look at this one! I would love to have a SUV again! I love this! I like to say my car is stocked, but really it’s just cluttered. I should do this. My sister and I collect pill bottles for my students to use for acrylic paint. I’m a reuser, for sure. I need to start getting my act in gear, and fix up my car space though.